The St. Claire is a project-based arts organization and online journal stationed in Philadelphia. 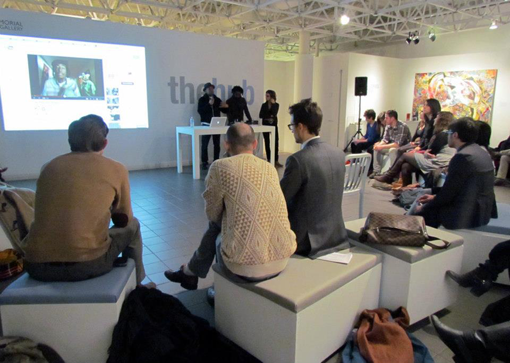 The St.Claire's core members are artists committed to examining and engaging our immediate art communities. Even though The St.Claire is a digital publication, we are committed to engaging the Philadelphia art community beyond journalism--beyond the screen. Everyday we work to bring bodies together and tongues to talk. Through conversation, collaboration, antagonization, experimentation, socialization, intoxication, and reciprocation The St.Claire is here to bring the art players of Philadelphia face-to-face; mind-to-mind. Whether it is in a Halloween poetry reading, an alt-sound dance party fundraiser, internship labor community forum, or a commercial gallery panel discussion, The St.Claire is rallying the best people and ideas that Philadelphia has to offer. We know that a strong future is built on communities of friends and not networks of connections. There is plenty of room at the table. Have a seat. Make a friend. Let's start talking.